I had an interesting conversation this morning with fellow author Nigeria Lockley about whether to tackle a book in first- or third-person. Our conversation sparked some ideas worth sharing because this question comes up often in workshops and even in critique group. Of the 21 fiction books I have written, 11 are first-person and 10 are third-person narratives. I speak from this body of experience only and I do hope other writers will chime in on the comments. My first book, Boaz Brown, came easily as a first-person novel because in many ways, I am LaShondra. We’re both educators, we both grew up in a Dallas suburb, we have the same church background and were raised in almost identical family structures. Couple that familiar background with the fact that I’ve been keeping a journal since the age of 12 and one can see how I found it fairly easy to sustain a first person book for 300+ pages. Then came the challenge with my second novel, Divas of Damascus Road. It’s a book about several women in a family dealing with drama. I started off writing the book in first-person because that was my style, but I got about five chapters into it and realized the story wasn’t working. I called my publisher, Denise Stinson, and told her my dilemma. I felt like someone had turned on a light in my head when she said, “Why don’t you try changing it to third person and see how it sounds?” I ran with her suggestion and the book came to pass, but I confess: I didn’t like writing it as much because I didn’t feel as connected to the characters. Since those experiences, I ask myself a few questions when it comes to deciding on point of view. 1. Who can tell the story best? If one very strong character has an excellent vantage point and has enough personality to tell the story, try first-person. Mama B is the kind of character who is very opinionated and has so many quirky little country, old-school sayings, no one call tell the story quite like she can. I don’t think she would want anyone else telling her story. I like the plots in her books, but (in my mind) it’s really all about being close to a godly woman like Mama B and seeing her relationship with God grow even at her age. 2. Is this more about the plot or the character? While ultimately good fiction brings both into play, if the book is more about what happens than who’s telling it, try third-person. You can be in lots of different places and know what’s going on “Meanwhile, back at the farm.” Unlike Kendra Norman-Holmes who always keeps men at the forefront of her books, I have a really hard time writing male main characters. I don’t think like a man, so it’s hard for me to go first-person with a male character. Anyway, my first attempt at a male main character came with the book Stepping Down. It was an especially tough go for me since it was a full-length novel rather than a novella. While the main character, Mark, does undergo his character arc, the message of this book was paramount in my brain. There was also a sub-plot going on behind his Mark’s back that needed to be told through is wife’s eyes, so third-person was the only way I could make it work. So there you have it. If you can write first person and get into the character’s head, give it a shot. But if the plot, your style, or even your genre dictates otherwise, stick to third. I realize that this blog comes down to the a age-old advice to “do what works for you.” I can only add to that wisdom by suggesting that you try your hand at both and develop your skill in both so that you can use them as each book demands. What a helpful article! Thank you for this! This is a great post. I struggle with thoughts of writing in first person/third person often. Thanks, Krystal! Hope this helps with the struggle! I’ve also found that if people are switching 2 pov’s within the book – that having one as first person and the other third person , helps the reader to discriminate between the two. Some teacher in some writing class somewhere way back when told us, point blank, do not write in first person. She told us it’s much more difficult to use than third person and we moved on. I’ve held onto the admonition over the years, because it’s true. Third person gives you much more flexibility when it comes to telling the story and getting the plot points covered well. In first person, your hero either has to experience the scene or tell somebody about the scene or have somebody else tell her about the scene. For the uninitiated, it’s easy to get into the tell-don’t-show trap. I personally like third person because I can use it to paint all of my characters in ways that are helpful to the story, not limited by the hero’s world view, knowledge and, well, character. Rather than painting a character through the hero’s eyes, I can paint the character more accurately and with more depth by simply telling a scene from the perspective of the character that makes the most sense. Finally, when it comes to plot, third person is just plain easier. I have a scene in my book that happens concurrently with another, and they involve different characters, different settings and simply cannot be handled by first person. First person is all the rage right now and it is great to read when written by somebody who knows what they’re doing. 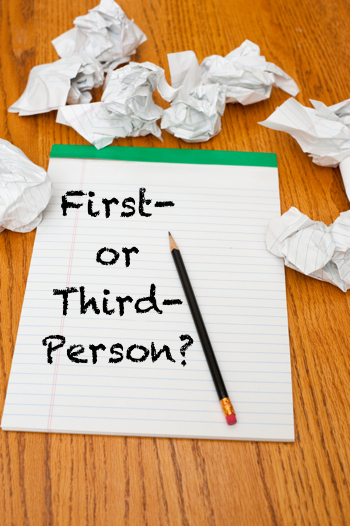 For the rest of us, third person may be a better tool. Thanks for chiming in, Michael! Great blog! I am writing my first novel and I am struggling with POV. I figured out that my novel is character-based so maybe first person will work best for me! I love writing in first person because it comes easily to me. I’m a writer who often has the habit of telling the story versus showing the story. It’s a struggle for me, but I’m working on improving it. Thank God for a great critique group! My first novel is written in third person, but I took the liberty of having my main character relay flashbacks in first person. I think it gives the book variety and a different perspective. Like your friend Lynne said, it’s great to self publish and do what you want! Great tips Michelle. Oh, I looooove a good flashback! Best to you, Faith Simone! I’m a man and I’m writing my Solo Ladies Bible Study series in first person woman’s voice. At conferences people ask me: “How can you write in a woman’s voice?” “As I sit down to write I put on an apron.” People like that visceral thought. Somehow, I can just climb into Martha McRae’s head and write the story in her words. I think God gave me the ability to do this. It’s heavy plot and character–a 1950s murder mystery/suspense allegory of Christ’s ministry. Women are more sensitive and wouldn’t give too graphic an account of the murder scenes. I have an agent now and working to find a larger publisher for the remaining series. Michael, that is definitely a gift from God! Best to you with all of your writing! I was wondering if you can help me out. I’m trying to find a list of Christian authors that write in first person. I’m writing a Christian Novel, and would like to read other 1st person novels that can help me to recognize the use of SNT (Showing and not telling). Plus, I like to read Christian Novels. PS. Have you ever considered writing with more than one 1st person voice? Then you can get into the heads of many of your main characters. I also read today, that some also mix first person and third person in their novels.